Hello everybody, welcome to my snowflake tutorial! 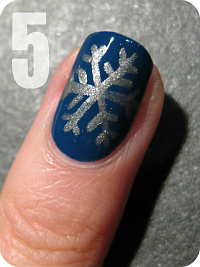 Snowflakes have such beautiful and delicate shapes that instantly make a cute winter mani. In this tutorial I'll show you how to make a detailed but fairly simple snowflake. All you need is a small nail art brush and two matching polishes. Let's start! 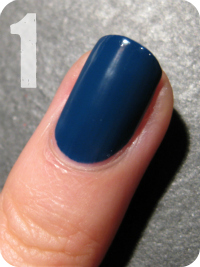 Begin with your base color (if necessary with a basecoat underneath) and let it dry. Because the snowflake will be quite detailed, I'd recommend using a plain base color like a creme or subtle shimmer polish, to keep the focus on your design. Use your nail art brush and a contrasting polish/acrylic paint to draw three lines that cross each other in the middle. ...but a little more detail will complete the design. So now add two bigger, slanted lines to just three of the six 'legs', alternating between each. The reason I'm suggesting to decorate only three of the six further, is because the nail simply isn't a very big canvas: if you'd add more of the slanted lines to every leg, the whole design would look a bit cluttered. Finally seal everything with a topcoat, clean up if necessary and you're done! Use this design as a pattern on all nails or as an accent nail if you want to keep your mani simple. Tip: Clean your nail art brush in between if you're using it for a long painting session. After a while polish will build up on it which can result in thick, goopy lines. Clean the brush by pouring a little bit of nail polish remover in a small dish (or the cap of the remover bottle), let your brush soak in it for a few seconds and dab it on a cotton pad a few times. Repeat this until your brush is clean. Polishes I used in this post are China Glaze First Mate and Essence Romeo (shimmer version). Wow!!! You are a great blogger and artist. Nice tutorial!!! always great designs and helpful tutorials! You always wow us with your designs. Thank you for the clear instructions! Shall try soon! Thank you for sharing! Pretty tutorial! Beautiful! I'm gonna make loads of snowflakes this month, and maybe I'll try this too! Hi there - I've only found your blog recently but have been making up for lost time poring through the archives - yay! thanks for taking the time to make these lovely tutorials, very much appreciated. heyy, I metioned this tutorial in my blog. It isnpired me for my new desing. ik ga hem zeker uitproberen! awesome!! definitely going to try it! !